Poor foot and ankle alignment can occur for many reasons. When the foot or ankle is not well aligned pain and instability often results. The pain and instability associated with poor foot and ankle alignment tends to increase with longer periods of weight bearing. Foot and ankle pain and instability often makes standing, walking or running difficult or too painful to undertake. Treatment of poor foot and ankle posture requires orthotic therapy and shoe advice. If there is inflammation of tendons, ligaments and joints then extra corporal shock wave therapy is indicated. 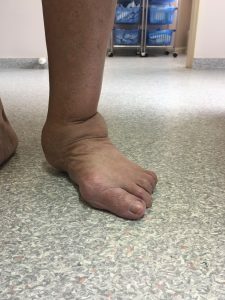 Read more In other cases a series of cortisone injections will be administered by our podiatric surgeon Read more.